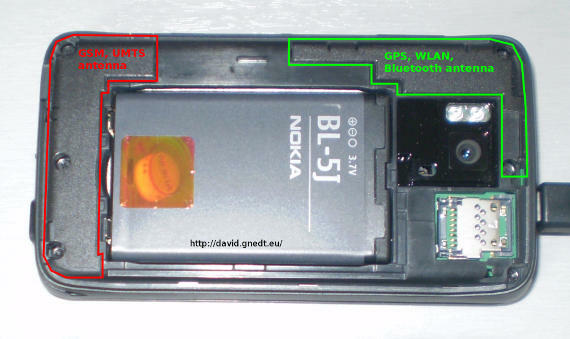 Maybe you also wanted to know where the antennas are located in the N900. I have done a little research on this and now share my results. As you can see on the picture the GSM and UMTS antenna is located on the left side of the battery. Therefore it is on the bottom when holding the N900 in portrait mode. The GPS, WLAN and Bluetooth antenna is located above the camera. hey thank you! I’ve been asking myself for months! :)) I guess that’s the dowside of being geek enogh to ALLWAYS skip the “readme” file. I know.. I too usually start punching buttons on a new device discarding the manuals that come with it, but now and then I use them al toilet-lecture. So – funny thing is – the position of all antennas is nicely depicted in the basic userguide that comes with all N900s. It even has some digital multilanguaged version somewhere on the device itself. 😀 lolz? eu procuro por wifi mas o n900 não acha nada.